When it comes to design, simplicity is often the best policy. 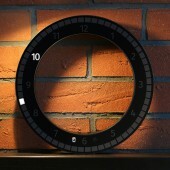 The Only clock was designed as a modern 3d interpretation of a traditional analog wall clock. According to Dieter Rams, good design is as little design as possible. In the process of making clock, designer was focused on the essential aspects, not burdening his object with redundancy and used this philosophy to create an eye catching and functional piece of art. Whether on a desk or on a wall, the Only clock is certain to turn heads. The material world becomes more complex on the inside and streamlined on the outside. Objects lose their massive material body and turn into contours, imaginatively reminiscent of their purpose. Modern technologies allow placing electronics inside the product housing in such a way as needed to turn it into a logically and conceptually sound frame - like symbol. The Only clock is the next step in the evolution of time devices and is based on research in the field of framework technologies. 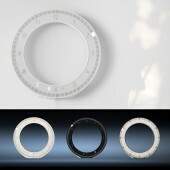 It is the first clock on the mass market with a hollow round face. The rooms interior can be any style, since the clock does not feature any prominent massive housing or a traditional clock face. The clock literally passes the environment through itself, dissolves it, and at the same time fulfills its function and projects the symbolic image of eternally flowing time. Round and round, day after day, not skipping one second. 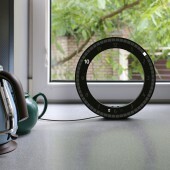 The clock measures 300 mm in the outer diameter, which ensures comfortable time reading from up to 8 meters. 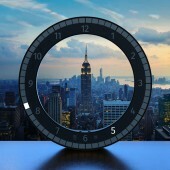 A clock this size can be placed on the shelf or on the wall, in groups or alone, in residential as well as office spaces. 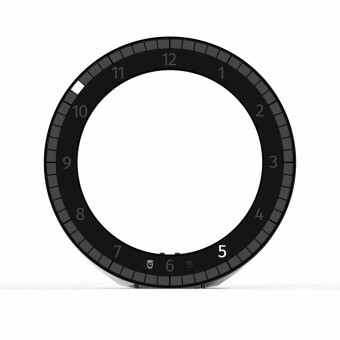 The Only clock is a clear and minimalistic desk-wall digital clock that was created by Vadim Kibardin. The project started in January 2016 and finished in January 2017 in Prague. We deliver award-winning solutions that meet marketing objectives, recognizing that successful product experiences come from a comprehensive understanding of users needs, wants and desires. We focus on probing current trends to determine which technologies will define the highest quality of life, and it helps our company deliver on ours brand promises by designing beautiful forms with meaningful function. Our design process consists of Discovery Phase, Concept Design Phase, 3d Modeling Phase, Detail and Prototyping Phase. Be in real time. The biggest innovation of the Only clock is that it replicates analog clock mechanisms with digital resources, showing time in completely new way. Each LED in the external circle indicates one minute and lights up for 60 seconds. So naturally, there are 60 LEDs in the internal circle just like there are 60 full minutes in 1 hour, and when the last one lights up, it indicates the actual time period between 18:59 and 19:00. 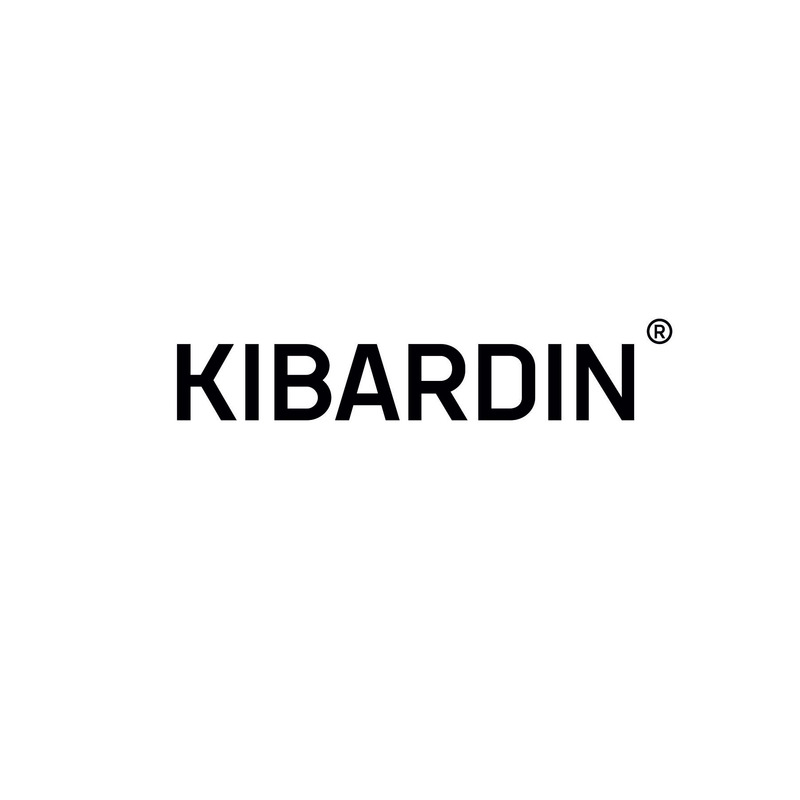 KIBARDIN® is a trademark of Vadim Kibardin, registered in the United States, the United Kingdom, Europe and other countries. Vadim Kibardin grew up in Omsk, Russia and graduated from the Ural State Academy of Architecture and Art’s Industrial Design Department, Ekaterinburg in 1996. Kibardin’s approach to design emphasizes both innovation and functionality. He takes the minimalist philosophy of stripping an object to its essentials to a completely new level. By exploring new ideas, materials and technologies, and executing them well, Kibardin’s work is highly artistic, smart and always inspiring. The Only Digital Clock by Vadim Kibardin is a Nominee in Furniture, Decorative Items and Homeware Design Category. · Click here to register today inorder to be able to view the profile and other works by Vadim Kibardin when results are announced. The Only Digital Clock by Vadim Kibardin is Winner in Furniture, Decorative Items and Homeware Design Category, 2016 - 2017. · Press Members: Login or Register to request an exclusive interview with Vadim Kibardin . · Click here to register inorder to view the profile and other works by Vadim Kibardin . Did you like Vadim Kibardin's Furniture Design? Did you like The Only Digital Clock? Help us create a global awareness for good furniture design worldwide. Show your support for Vadim Kibardin, the creator of great furniture design by gifting them a nomination ticket so that we could promote more of their great furniture designs.